When the Blitz begins and bombs start raining down on London, both RueAnn and Susan must find the strength and courage they never knew they had in order to survive. They form a friendship out of the city’s ashes, one that helps them weather the storm as they wait for news from the front—from the men they love, have lost, and hope desperately to find once more. Set against the backdrop of a remarkable era, INTO THE STORM brilliantly explores relationships in wartime, when the passion shared in just one day could sustain love for a lifetime and the love borne of one night’s deception could become the truth that saves a life. Into The Storm stays true to its title as there is never a dull moment for the characters of this World War II-set novel. Although very character-driven, the plot focuses on the Blunt family and their neighbors, thrust together during London air raids. American RueAnn Tolliver chases after her new husband and finds her reluctantly welcomed by her mother-in-law and the Blunt family. Twins Susan and Sara Blunt struggle to keep their family together during very harsh times of rations and the harsh realities of their country suffering through bombing raids. With a bit of espionage interlaced with Charles Tolliver's storyline, the romance and the historical details make for an intriguing and very promising story. Into The Storm reads swiftly and easily, with smooth writing that draws the reader in. There were quite a few characters whose stories eventually intermingled but one could sense the rushing of the story to get to the end, where it would have better suited to add a few more pages to the novel to flesh it out. While the story reveals grief and sorrow as the characters develop, the romance brought a happy-ever-after feel with perhaps a touch of incredulity. 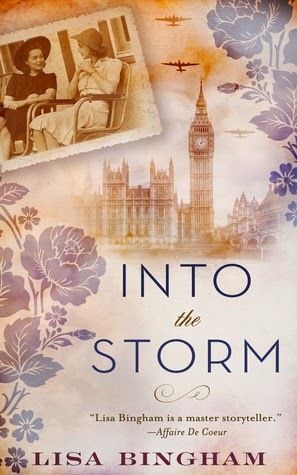 Still, Into The Storm is a very enjoyable World War II novel with a stronger character development theme than the romance factor, as the heat rating was very low key.